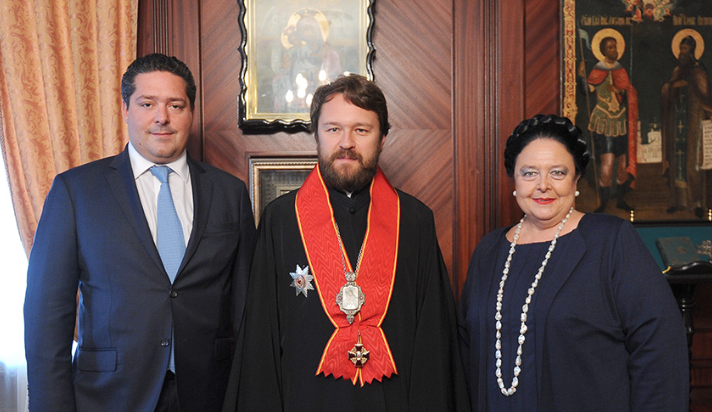 Grand Duchess Maria Vladimirovna and Grand Duke George with Metropolitan Hilarion (Alfeyev) of Volokolams, the chairman of the Department of External Church Relations, permanent member of the Holy Synod of the Russian Orthodox Church, and a Knight of the Order of Saint Anna, 1st Class, awarded in 2013. The Head of the Imperial House of Russia stands in the shoes of the Emperor of Russia. The successive post-revolutionary heads of the dynasty have made clear in their accession proclamations that they had succeeded to all the rights and duties which belong to the Emperor under the Fundamental Laws of the Russian Empire and the Statute of the Imperial Family. By way of example, only the head of the dynasty may speak on behalf of the Imperial House. Only the dynastic head may interpret, supplement or amend the dynastic house laws; commit the Imperial House to the patronage of various initiatives supporting charitable organizations, architectural conservation, or the preservation of cultural patrimony; award the historic orders of chivalry of the dynasty; approve marriages of dynasts; and create titles for non-dynastic (morganatic) descendants of members of the Imperial House.